Sthita Prajna means “to be established in wisdom.” Sthita means “established” and prajna means “wisdom.” In the Bhagavad Gita, it states that a sthita prajna is one who has thorough control over the senses, one who is always aware of the inner spirit, does everything in the awareness of the soul and as an offering to God with love and without anxiety or emotion. Sthita Prajna Journal is a quarterly publication of Prajnana Mission which brings news of activities in India and abroad, many inspiring messages of the masters, rare metaphorical interpretations of the scriptures, and practical application of spirituality in everyday life. Current issues and archive issues are available at www.prajnanamission.org. The journal has a wide circulation in India, the Americas, Europe, Australia, and New Zealand. For more details on subscription to get the printed copies contact: seva@prajnanamission.org (for USA/Canada residents) or contact@prajnanamission.org. 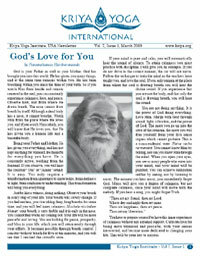 The Kriya Yoga Institute, USA Newsletter is prepared and distributed in the Spring and Fall of each year. Each newsletter includes divine teachings from Paramahamsa Hariharananda, a message and teaching from Paramahamsa Prajnanananda, a feature article, and news from Kriya Yoga centers and groups worldwide. In addition, there is information about the various charitable activities that take place throughout the world. Kriyavans, upon initiation into the lineage of Paramahamsa Hariharananda and Paramahamsa Prajnanananda, are automatically added to the mailing list. Others may subscribe by sending an email or contacting their regional headquarters.